Paper fold your way to outer space. I never waste time at work. Where Good Ideas Come From by Steven Johnson. The importance of liquid networks. How to foster your own liquid network. Where in the world are your participants? Evidence-based psychology, partnership principles, and presentation skills. According to Robert Gagné, an eminent instructional psychologist, one of the first things that you should do during a training session is to announce your objectives. Let's explore how this guideline impacts on the design and use of training games. You motivate participants by providing them with a desirable goal that they would like to achieve. You align participants' expectations with your intentions. Participants understand where you are taking them. During the learning journey, they continuously measure their progress toward this destination. You provide a preview of things to come. This permits participants to selectively listen, take notes, and practice to master relevant skills and knowledge. You may encourage participants to ignore personally meaningful insights just because they are unrelated to your objectives. You may increase participants' anxiety level, especially if you state your objectives in incomprehensible technical jargon. You may confuse participants by presenting too many details about the behavioral outcomes, conditions, and required standards. All learning involves change in behavior. Some changes bring out resistance. Therefore, by emphasizing behavior changes in your objectives, you may increase participant resistance. By revealing the training objective, you may remove one of the most joyful elements of learning—the element of discovery. Let's explore strategies for avoiding the shortcoming and guaranteeing the benefits of specifying objectives at the beginning of your training session. At the end of this training session, given a set of 10 simultaneous algebraic equations involving two unknown variables, the learner will be able to correctly solve at least 8 of them, within 10 minutes, and without using any references or calculators. Upon completion of the training session, without using any reference materials on sexual harassment, the learner will be able to provide the correct definition of a hostile work environment and list at least three legal consequences of not taking corrective action with regard to such an environment. These statements of objectives are useful—for an instructional designer or an evaluator. However, if you begin a training session by sprouting statements in this form, you are more likely to increase participants' levels of anxiety and confusion rather than their level of motivation. The best strategy for presenting your training objective is to focus on the benefits for participants. Also, plain language is more important than precise language. So why not begin your training session with statements of objectives such as these? Want to avoid expensive lawsuits and negative performance reviews? Find out how your “harmless” jokes and the “funny” cartoons on your bulletin board can result in a telephone call from a lawyer. Most participants would prefer these playful statements to the earlier specifications of the same objectives. If you feel uncomfortable about leaving out details, remember that you can return to your objectives later in your training session and make them more precise. Stump the expert. Present this puzzle: You and I have a total of 120 dollars. You have 20 dollars more than me. How much money do you have? Invite participants to yell out the answer. Most people would say $60 or $80. Both of these answers are incorrect. Give the correct answer ($70). Now give 3 minutes for participants to create their own puzzles using the same format. Ask them to take turns to present their puzzles. Immediately give the answer (using the technique that you are going to teach them). After participants are suitably impressed, specify the training objective by saying that they too would be able to solve these types of puzzles rapidly and correctly. You be the judge. Distribute a handout with half-a-dozen summary descriptions of sexual harassment lawsuits involving a hostile work environment. Ask participants to guess the penalties awarded in each case. Give the correct answers (which would surprise most participants). Specify the training objective by saying that participants are going to learn how to avoid heavy legal penalties. The effectiveness of many roleplays, simulation games, and jolts require participants to behave according to their natural inclination—and then discover how their assumptions and habits contributed to dysfunctional behaviors. In situations like this, announcing the objective in advance will obviously defeat the purpose of the training. There cannot be any self-discovery when participants are told what they should discover. With training games that hold up a mirror to participants and increase their awareness of assumptions, stereotypes, prejudices, attitudes, beliefs, and values, you may consider withholding the training objectives. However, you should reveal your objectives and discuss them in detail during the debriefing session. Informing participants about your objectives at the beginning of a training session provides some benefits and creates some problems. Mechanical recitation of training objectives according to some standard formula may create confusion and anxiety. Present training objectives in terms of benefits to participants. Invite participants to experience the objectives through a short game. In situations where self-discovery is important, delay the sharing of training objectives until the debriefing discussion at the conclusion of an experiential activity. An increasing number of our clients ask us to deliver training workshops as webinars instead of face-to-face sessions. They have apparently arrived at this objective decision by applying a single criterion: reducing cost. Our clients are also satisfied with talking head sessions (minus the talking head) that use a barrage of PowerPoint slides to dump data. However, we feel guilty about this approach since it's the adult equivalent of taking candy from a baby. So we have been experimenting with increasing interactivity in our virtual classrooms as an approach to improving instructional effectiveness. We “ported” several interactive classroom strategies, dropped some of them, and adapted the others to leverage the online environment. Here's our list of 25 interactive strategies for live online learning. Remember, we are instructional designers and not technology gurus. Hence these approaches are platform-agnostic and use the commonest webinar features. Assessment-Based Learning Activities (ABLAs) require participants to complete an online test, a rating scale, or a questionnaire and score their own performance. In the test-first approach, the facilitator focuses on the items that were missed by the participants. Brain-Pick Activity. This activity involves four or five “informants” who have significant experience and expertise in the training topic. The participants are divided into as many teams as there are informants and assigned to separate breakout rooms. The informants rotate around the rooms where they are interviewed by the team members. At the end of the interviews, each team prepares and presents a summary of what they learned from the informants. Case Method begins with an audio or text display of a real or fictional scenario surrounding a problem. By typing text messages, the participants analyze, discuss, make decisions, and apply concepts and principles associated with the case. The facilitator adds additional insights and removes any misconceptions. Closers are activities conducted near the end of the online learning session. They use interactive discussions for reviewing main points, tying up loose ends, planning application activities, providing feedback, celebrating successful conclusion, and exchanging information for future contacts. Consensus Decisionmaking Activities involve a list of items (usually 10) to be arranged in order of priority. Participants send text messages to each other and then reach a consensus. The facilitator presents priority rankings from an expert and invites participants to discuss any differences. 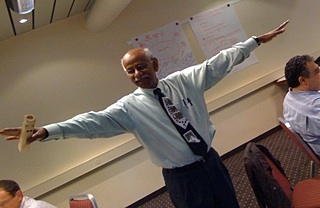 Debriefing Activities are used for encouraging reflection and dialogue about an earlier experience from the workplace or a training activity (such as a roleplay or a simulation game). These activities involve processing of the common experience through a typed-chat discussion to extract key learning points from it. They encourage participants to identify and express their feelings, recall events and decisions, share the lessons they learned, relate insights to other real-world events, speculate on how things could have been different, and plan for future action. Double Exposure Activities present training videos or audio recordings. The participants watch a segment or listen to a segment and then interact with each other through typed-chat discussions to review and apply the new concepts and skills. Graphics Games involve photographs, paintings, drawings, or cartoons as an essential element. Some graphic games require participants to create these graphics. In other games, the participants review the graphic, analyze its elements, discover relationships, and discuss their findings. Improv Games increase the participants' fluency with concepts and terms. Most improve games require the participants to type-chat responses to open questions their ability to recall key information and to think creatively and spontaneously. Instructional Puzzles challenge the participant's ingenuity and incorporate training content that is to be previewed, reviewed, tested, re-taught, or enriched. They can also be used to train people on different types of thinking skills. Interactive Lectures involve participants in the learning process while providing complete control to the online facilitator. These activities enable a quick and easy conversion of a passive presentation into an interactive experience. Different types of interactive lectures incorporate built-in quizzes, interspersed tasks, teamwork interludes, and participant control of the presentation. Interactive Storytelling involves fictional narratives in a variety of forms. Participants may listen to a story and make appropriate decisions at critical junctures. They may also create and share stories that illustrate key concepts, steps, or principles related the instructional objective. Item Processing activities begin with a display of guidelines, principles, facts, questions, or suggestions. By text-chatting with each other, the participants organize these items into appropriate categories. Jolts lull participants into behaving in a comfortable way and deliver a powerful wake-up call. They force participants to re-examine their assumptions and revise their standard procedures. Online jolts typically last for a few minutes but provide enough insights for a lengthy debriefing. Magic Tricks incorporate an online conjuring trick as a part of a training session. These tricks provide metaphors or analogies for important elements of the training content. They are also used as processes to be analyzed, reconstructed, learned, performed, or coached for training participants in appropriate procedures. Matrix Games require participants to type the content in boxes of a grid displayed on the screen. The activity could be designed as a contest between individuals or teams to supply the most appropriate response for each box. Openers are live online activities conducted near the beginning of a training session. They use interactive strategies to preview main points, orient participants, introduce participants to one another, form teams, establish ground rules, set goals, reduce initial anxieties, or stimulate self-disclosure. Pair Work involves two people working on the same whiteboard to provide a joint response to a question. This strategy could be used at the beginning of an online session or at the end to provide a review. Reflective Teamwork involves participants typing suggestions for a checklist on some aspect of online collaboration. Teams then evaluate their own performance by using the product they created. Roleplays can be easily conducted in a live online session. The participants can be paired up to type-chat with each other or two volunteers can use their microphones to conduct an audio roleplay. Other participants may type their comments and coaching suggestions. Sampling Activities present a collection of different examples (such as email subject lines , conference session descriptions , lead paragraphs of articles , or names of popular products ). Through text-chat messages, participants analyze the samples, arrange them in different groups and sequences, identify key features, and list quality standards. Later, they apply their discoveries to create new products that meet their needs and conform to the standards. Structured Sharing activities require and reward mutual learning and teaching among participants through text-chats. These activities create a context for a dialogue among participants based on their experiences, knowledge, and opinions. Textra Activities combine the effective organization of well-written documents with the motivational impact of interactive strategies. Participants read short messages on the screen or longer documents that are downloaded. Later, they participate in an interactive exercise that uses peer pressure and peer support to encourage recall and transfer of what they read. Troubleshooting Simulations can be used with technical topics and interpersonal concepts. They begin with a scenario presented by the online facilitator, supplemented by displays of instrument readouts. The participants suggest tests and the facilitator provides appropriate data. The process is repeated until the cause of the trouble is identified. The activity is followed by an online debriefing discussion. Values Clarification uses forced choices, provocative issues, and confrontation of participants' inconsistencies. The strategy helps individual participants to decide among alternatives and determine what has personal meaning. The process does not force one set of right values but rather encourages discussion and exploration of alternatives before choosing a specific value. We will explore these interactive strategies in future issues of TGL . Here's a jolt that incorporates a puzzle. Each person gets a copy of a mini sudoku puzzle with an extra number as a clue. Participants assume that it is an individual test and try to solve it independently. Facilitator points out that if they had cooperated with each other they could have compared the different clues and quickly solved the puzzle. To challenge the fallacies of assuming that everyone begins with identical resources and that all tasks have to be completed independently. Sample mini Sudoku puzzle (64K PDF) with instructions and solution. Prepare copies of this sample for each participant. Print a copy of the difficult puzzle and try to solve it. It can be solved, but it is a fairly difficult puzzle. Prepare individual handouts for each participant. Estimate the number of people who will be attending your session. Run off that many copies. Each puzzle has 12 numbers already printed in appropriate spaces. Add one extra number to each copy of the puzzle. Use the solution below to write a different number on each handout. Since there are 24 blank spaces in the original puzzle, you can prepare 24 different versions. If you expect more than 24 people, cycle through the numbers again. Demonstrate how to solve mini Sudoku puzzles. Distribute the sample mini Sudoku puzzle and explain how to solve it. Point to different spaces in the puzzle and invite participants to yell out the number that goes there. End the session. After about 2 minutes, blow the whistle and act surprised that the puzzle is not yet solved. Explain that the previous groups had solved the puzzle by this time. Explain the situation. Point out that this was actually a test of the participants' ability to collaborate with each other. Explain that each participant had a different extra number and if all the participants had shared the information and worked with each other, they could have easily and rapidly solved the puzzle. All puzzles have to be completed independently. Everyone has the same extra number. We are competing with each other. Don't assume that everyone begins from the same place. Even if all the participants had identical handouts, they still bring different experiences, expertise, perceptions, logic, and work styles. Don't assume that you have to complete all your tasks independently. Change your default assumption to treating all tasks as collaborative endeavors. Be quick to ask for—and offer—help. Participants take a sheet of paper and are asked to repeatedly fold it in half. When they can no longer fold the paper they are asked to predict how many folds they would have to make to reach specific distances. To convince participants about the speed of exponential growth. One piece of paper, napkin, or paper towel for each person. Fold paper in half. Distribute a piece of paper to each participant and ask them to fold it in half. Then, ask them to fold it half a second time, then a third time, and continuing counting and folding as much as they can. Most people will be able to do 7 folds. This is about a half an inch or the thickness of a spiral notebook. Make a prediction. Ask the participants to use their folded paper as a reference and write their prediction for how many folds it would take for a folded piece of paper to be the width of an average person's hand (including the thumb). Then ask them to write and predict how many folds it would take for a folded piece of paper to be as tall as a four story building. Finally ask them to write and predict how many folds it would take for a folded piece of paper to reach the outer limits of the solar system. Reveal the answers. After the participants have written their predictions, reveal to them the correct answers. An average hand would take 10 folds, a four-story building would take 17 folds (42 feet), and it would take only 30 folds to reach the edge of outer space (66 miles). Explain the concept of exponential growth. Of course it is not physically possible to fold a piece of paper that many times, but still most people will be shocked to discover these facts and they may think you are tricking them. Explain exponential nature of paper folding by pointing out that each time you fold the paper in half, the thickness of the paper layer is doubled. Give a calculator to one of the participants ask her to multiply 2 by 2. Have her multiply the product (4) by 2 and continue multiplying the ensuing products repeatedly by 2. Keep counting the number of times the product is multiplied by 2. Point out that product keeps increasing rapidly as you move into larger numbers. Very soon, the number will overflow the capacity of calculator's display. Debrief. Ask the participants how the exponential growth of paper folding relates to different events the workplace (word of mouth marketing, pay-it forward, procrastination, and compound interest)? Ask the participants what things they should do to take advantage of the power of exponential growth. In the case of negative word of mouth comments, ask the participants what they should avoid doing because of the power of exponential growth. Small things can turn into huge things because of exponential growth. Find new uses and markets for a company's current products. A collection of random items such as a coffee filter, a paper clip, a Ziploc bag, and a current product from your company. Explain the activity. Introduce one of the random items (example: a coffee filter). Ask the participants to write a list of as many possible alternative uses for the item that they can think of in the next 3 minutes. Share ideas and compute scores. After 3 minutes, blow your whistle and ask the participants to stop writing. Share your list of alternative uses for the random item with the group (examples: line a plant pot, clean eye glasses, provide separators between fine china dishes, cover dishes being cooked in a microwave oven). Tell the participants to give themselves one point for each original idea they have on their list that you have not mentioned. Acknowledge high scoring participants. Ask if anyone has a personal score higher than 20. Count down until you identify the person with the highest score. Ask that person to share her unique ideas. Ask the group if anyone else has a unique idea that has not yet been shared. Introduce a new item. Continue the activity as before until you run out of time. Be sure to introduce the company product during the last round. Reprinted from the January 2011 issue of Firefly News Flash by permission of the author. Great new ideas are all around us waiting to be discovered! If you are having trouble finding them, this month's pieces may be of help beginning with this 99-Word Story. Listening to the radio, I heard that Americans waste an average of 2 hours at work every day. That translates into $759 billion lost! Me? I never waste time at work. I'm too busy making connections, building social capital. A walk to the water cooler puts me in touch with other people, their projects, their problems, and their needs. Even the physical act of moving gets my brain working in different ways, exploring new paths. I always return to my desk with several new ideas. Perhaps we ought to redefine “work” and how we value it! This was a phrase I often heard from my mother. It expressed her awe about brilliant innovations whenever she saw them. It also expresses the common perception that new ideas come to us out of thin air. In his book Where Good Ideas Come From , Steven Johnson dispels this myth by offering a historical perspective on how new ideas are conceived, evolve, and take root in society. Instead of brilliant ideas coming to us out of the ether, Johnson explains that each innovation is build upon previous ideas. New concepts are always cobbled together. Each idea actually uses previous innovations as its building blocks. And some ideas are even ahead of their time because there isn't the political, social, or physical infrastructure in place to support them. The earliest programmable computer was conceived and designed by Charles Babbage in the 1870's but it couldn't actually be built out of the mechanical gears available at the time. The idea had to wait until the vacuum tube was invented nearly 100 years later! Encourages ideas to be recombined in novel ways. Uses large, malleable networks to share information. Allows time for a hunch to develop and become connected to other concepts. Tolerates ambiguity and a bit of chaos to foster serendipity. Welcomes errors that lead to further experimentation. Takes concepts from one field and applies them to another. Creates a framework or set of standards that can become the foundation for further innovation. Johnson also challenges the common notion that the competitive marketplace is the best environment for new ideas. Because competition typically has to do with developing ideas that are marketable, a market-driven innovation may be shrouded in secrecy by patents and copyrights. While these laws do protect the intellectual property of the inventor, they set up barriers that prevent further innovation by limiting the free exchange of ideas that can produce synergy. Profit is sometimes a motivation for innovation, says Johnson, but it is not the biggest source of new ideas. A university research environment is typically more conducive to paradigm-shifting innovations. The book includes an informative Chronology of Key Innovations, 1400 - 2000 which provides helpful perspective for people who, like my mother, are dazzled by innovation. Whether you want to shift a paradigm or energize your own creative process, you'll find ideas, inspiration, and historical examples in Where Good Ideas Come From , © 2010 Steven Johnson, Riverhead Books, ISBN 978-1-59448-771-2. The 99-Word story this month suggests that whether what we are doing at work is wasteful or productive depends upon our definition of what work is. There is a lot that could be happening around the expected work tasks that actually makes a huge contribution to the real work that eventually gets done. The same could be said for creativity: it's not an activity that fits a simple definition. Contrary to the popular myth of the wild-eyed inventor working solo in a lab, good ideas that characterize lasting innovations occur most often in situations where many ideas are shared, people are encouraged to pursue hunches that produce mistakes as well as successes, and there is space for serendipity. One concept that Johnson talks about in his book Where Good Ideas Come From is the importance of liquid networks. Anyone connected to the Internet knows the value of networks for transmitting and sharing information. But a network protected by a firewall is also insulated from the outside influences that could be the genesis of a new idea. A fluid network that allows for the overlap and collision of ideas is more likely to produce novelty. Johnson makes the analogy of water changing from a solid to a gas to explain liquid networks. Ice is too rigid for any change to happen. Steam is too volatile for any changes to be contained and have a lasting effect. However, water in its liquid form can combine with many other elements to create new substances. In a liquid network, things are a bit messy and mixed up as ideas swirl around but in that swirling, something new will eventually coalesce. Liquid networks are not confined to the Internet. They exist in organizations when people meet across departments to talk shop. Whether it's a brown bag lunch or chance moment of chat at the water cooler, unstructured sharing can be as productive as a formal brainstorming session. Keep an eye open for liquid networks in your work environment and when you notice the flow of innovation, please share it (email Brian)! What will be the spark of your next creative idea? When will it happen? Is there a concept you've been wondering about for a while, a “slow hunch” as Johnson would call it, that's waiting to be connected to other concepts before it can take off as an innovation? Spend more time talking to colleagues and learning about their work. Start with your own department then widen your network to others in your organization. Develop more fully one of your hobbies or special interests outside of work. Dig in and become an expert. Read a magazine from outside your field or different from your comfortable political views. Go on a free-association tour of the Internet. Follow the “bunny trail” of links to its illogical conclusion. Try any of these suggestions then take one more step: get physical. Go for a walk, take a shower, shovel snow, work in the garden, vacuum the bedroom. Any physical activity will allow your mind to free associate, flowing from one idea to another making links and connections you hadn't expected. When you invent new connections or ideas after this activity, let me know (email Brian). I'll be surprised if you don't discover something! Here's your chance to attend Thiagi and Tracy's Interactive Techniques for Instructor-Led Training Workshop. Attend the fourth day and become a certified Thiagi trainer. You can find more about the workshops in our detailed brochure (194k PDF). 3-Day Workshop (March 28-30, 2011): $1,495. Online. Visit our online store at thiagi.com and click on “Workshops: 2011”. Check out our detailed brochure (194K PDF) or call Tracy at (805) 494-0948 . Increased international trade and the internationalization of production and financial markets have rapidly contributed to a global economy. The global economy has in turn contributed to the increase in global organizations. As businesses expand internationally, they must consider whether they should centralize the company's learning functions. Many learning leaders agree that the global integration of learning is important. They recognize that it provides for more standardized company-wide practices and the elimination of overlapping resources across regions. Despite the advantages experienced by some, other learning leaders have found the global integration of learning fraught with hurdles and obstacles. For example, they mention the challenges of facilitating team projects across geographical borders and time zones, dealing with regional differences in technology, and translating training materials into local languages and local idioms. Has the globalization of industries, economies, and governments affected the way you deliver and design training? What are some of considerations, challenges, and benefits you have found in the global classroom? Nigel: I believe that as we globally integrate the learning function we should focus on how to view the same world with multiple perspectives rather than comparing and contrasting one culture to another. I have found that training that focuses on cross-cultural differences often just reinforces stereotypes. Samantha: Avoid using scenarios or examples that may not be familiar to some of the participants. For example, using the football game as a metaphor may not work around the world because football in the U.S. is different from football in the rest of the world. Rajan: My advice is to integrate the learning function of your company incrementally, rather than all at once. The first step is to identify which functions are local, regional, and global, and then consider why some should be more integrated than others. Garreth: I have to schedule training workshops for my company's departments all over the world. To avoid scheduling on national holidays, I check for worldwide holidays at www.earthcalendar.net. Last month we asked if you use mnemonics in your training. Of those of you who responded, 79% said, “Yes”. Response 9) I make up my own mnemonics because we are an acronym-flush organization. My latest was to paraphrase a set of attitudes for connecting well with customers, cited by Nicholas Boothman in his writings: Welcoming, Enthusiastic, Resourceful, Curious. The first letters spell WERC—and I say, these WORK (WERC). Response I ask my new leaders to break the ICE daily! The four of us at the Thiagi Group are voracious readers. Sometimes we succumb to our individual addictions (murder mysteries, politics/history, chick lit, and science fiction) but most often we read the latest books on training, interactive design, performance improvement, and management. Wiseman, Robert (2009). 59 Seconds: Change Your Life in Under a Minute . (ISBN: 978-0307474865). Most self-help books are based on hunches and hype. They frequently backfire and produce results that are the opposite of what they promise. This book, written by a psychologist and a best-selling author, is different. Every one of the practical suggestions is based on research evidence. However, the book does not sound like a research report with its clear language. You can immediately incorporate the recommended techniques (some of which are counterintuitive) in your life and become more imaginative, decisive, engaged, and happy. This book is by Roger Martin, one of my favorite authors. I came across this book during my research into the nature of true collaboration for a training workshop that I am designing. Here's the key principle from Roger's analysis: heroic leaders and unquestioning followers form dysfunctional partnerships by taking on too much or too little responsibility. I found Roger's ideas immediately applicable to my professional life and consulting practice. I have read and used Garr's earlier book, Presentation Zen , and I recommend this current book to everyone who is interested in acquiring and improving presentation skills. I like Garr's fresh approach and his suggestions for presenting with simplicity, clarity, honesty, integrity, and passion. If you use slides, they must never steal the show. Use the ideas from the book to connect deeply with your audience to deliver the essence of your message.